Ben Oort is an ultimate player from the future. Not because of his game, although he is versatile, capable of thriving in any position on the field. Not because of his age, although he is the youngest player in the AUDL – eighteen-years-old, born on the 1st of January, 2000. Ben Oort is the tip of the wave of modernization soon to crash into the sport of ultimate because he will do anything to get better. 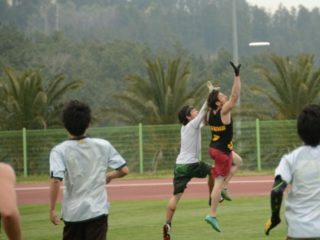 Ben was born among the first generation of Frisbee players who would play the game from birth. His father, Jeroen, discovered ultimate at the age of twenty-three and fell in love with the sport. He has represented Dutch National teams at least ten times, playing in cities from Ottawa to Prague, Minneapolis to Vancouver. During Ben’s early years, family vacations were organized around Jeroen’s tournament touring schedule. Jeroen remembers Ben learning to catch as well. 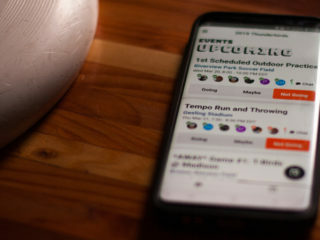 By the time Ben was nine-years-old, he was introduced to the organized sport of ultimate Frisbee. Children from all around the Netherlands came to Amsterdam to play in sorts of hat tournaments, as each city didn’t have the numbers for individual teams. Even at a young age, Ben was beginning to stand out from his peers. Those thirty or forty players would be the origin of Grut, Ben’s beloved mixed club team. Though currently a rookie on the Toronto Rush, Ben’s one true Frisbee love is Grut. His girlfriend, Floor, also plays on Grut, and Ben and Jeroen both admit that she is a better player than he. The seedling of Ben’s idea to move to North America to play in the AUDL grew from his trip to Chicago for CUT Camp when he was fifteen. He boarded the plane alone. Ben and Jeroen knew that he needed to play on teams for which he wasn’t the best player. Generally the youngest player by several years on whatever team he joined, Ben’s throwing talent allowed him to thrive. He needed more challenges. He briefly joined Rebel, a terrific Irish club team, for a tournament in Belgium, and loved the experience. It would foreshadow Ben’s decision to join the Toronto Rush. Thirteen-year-old Ben Oort skys for the disc. After his trip to Chicago, Ben knew that North America was the most fertile grounds for him to improve his game. At the 2017 Beach World Championships in Royan, France, Jeroen found contact information for Sachin Raina, the head coach of the Toronto Rush. Sachin’s history was a sign that the Oorts had come to the right place. Sachin has long been a fixture in the Canadian ultimate scene, but in 2009 and 2010, he lived in Amsterdam teaching at Vrije University. He joined a club team called the Cakes, who regularly scrimmaged against the Red Lights, a Master’s team that rostered one Jeroen Oort. The two were never close, but they shared a mutual respect on and off the field. Even almost a decade later, Jeroen knew that he could trust Sachin with his teenage son, and Sachin knew that any offspring of the athletic initiation cutter he remembered from Amsterdam would be talented enough to contribute to the Rush. Furthermore, Sachin was excited to contribute to the development of a Dutch player, as he had played for the Amsterdam club team at World Club Championships in 2010 and the Dutch National team at World’s in 2012. Ben arranged two tryouts in Toronto and D.C during a short, six-day trip to North America. Ben did not think he performed well in tryouts due to attendees’ desires to show off, and his versatility didn’t shine. However, he had an important qualification on which he could rely. Ben came second in the European Youth Player of the Year Award, after only making the video thinking it might appeal to AUDL teams. Ben was eventually invited to play on both Toronto and D.C, but he chose Toronto due to its talent, internationalism, and Sachin. Mostly it’s talent. The chance to compete for an AUDL championship was unmissable. “I love winning. I love winning. That’s something that I really enjoy,” said Ben. And so an eighteen-year-old found himself boarding another plane back to North America, unaccompanied, in order to spend all of his savings and play professional ultimate Frisbee. Ben spends his days when he’s not with the Rush working out and throwing discs. He knows why he’s in Toronto and stays dedicated to the task of improving. He explores Toronto, and his favourite area thus far is Kensington Market. Ben spent a month living with teammate Goeff Powell and his girlfriend Courtney. Powell described Ben as the perfect houseguest and makeshift son. Powell introduced Ben to American sports, watching the Leafs and Raptors lose heartbreakers. They talked about cultural differences and, of course, sports. At Easter, he tried Turkey for the first time, and purportedly loved it. When he moved out, Ben bought Stroopwafels – a Dutch dessert cookie meant to sit overtop of a steaming cup of coffee – for his Canadian parents, giving a bag to each of them, knowing that Courtney would never eat any if he only left one bag. “It was nice to have someone else around, definitely. It was kind of sad when he left yesterday. It felt kind of empty. We’re like empty-nesters now,” mused Powell. On the field, Ben is already contributing to the Toronto Rush’s success. With a 6-foot-7 wingspan, Ben has used his length to contribute via throwing. His speed and athleticism have allowed him to record some receiving highlights, already compiling five goals on the young AUDL season. Two plays in particular stand out. Ben has played in two games for the Rush. In the first, against the New York Empire, the athletically gifted Jeff Babbitt was covering Ben, who made a deep cut to space and earned a flick huck from teammate Mark Lloyd. Babbitt flew inside of Ben, laying out just in front of the rookie for the remarkable block. Ben, however, didn’t hang his head. Ben quickly found more success against the defending champions San Francisco FlameThrowers. With his team up 6-5 in the first quarter, Ben saw a poach opportunity while on defence and chased down an opponent’s huck. Starting several strides behind a former World Champion in Byron Liu, Ben caught up to make a clean block against the much older and more accomplished player. Ben doubts he’ll stay in North America for more than six months, but he doesn’t know his future. He may go to university. He’s worked as a cook in the past, which he enjoyed. No matter what path he walks, ultimate will accompany Ben, leading him like it did his father. I asked Ben what his goals were in the future, ultimate or otherwise. He answered immediately. Ben is already a world-class player, and he won’t hit his prime for a decade. He has the potential to be one of the best players in the world. 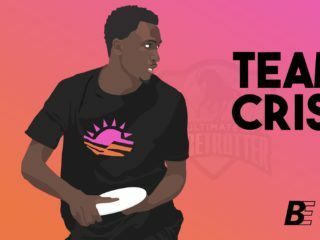 Like an Arnold Schwarzenegger sent back from the future, Ben is single-minded in his focus on ultimate. And yet, he isn’t focused on himself, but instead on Grut. They’ve already captured Dutch and European Championships – with Jeroen as the coach – but Ben is searching for glory in greater pastures. One of the main purposes of the trip is to return to his treasured team and use his newfound talents to help Grut win a World Championship. Ben knows that this trip will be about more than Frisbee. Everyone with whom I spoke described him as outstandingly mature, and he’s sure to wring every last drop of reward from this adventure, including during those moments that extend beyond the sport. Jeroen admitted that Ben’s trip should benefit his life more than his Frisbee game. It always comes back to the sport. Life and Frisbee are inseparable for Ben, like they were for Jeroen when Oort vacations revolved around Jeroen’s tournament locations. When Jeroen was in his prime, there was no professional league, and he only learned about the game in his early 20s. Ben has grown up on a Frisbee field. Perhaps the thousands of hours he’s spent throwing before his twentieth birthday have seeped through his fingers into his blood, like a welcome and wanted germ. The AUDL is a beacon signal that draws players of Ben Oort’s ilk. It may seem strange for an unaccompanied teenager to voyage across the world to improve his ability in a sport that will likely not be his career. Neither Ben nor his family ever doubted the decision.